PVC Coated Steel Opti-Com® multi-duct is manufactured in 10-foot layable lengths with treaded and coupled ends. Each 10-foot length is provided with a locking external coupling and a gasketed Opti-Com® internal coupling for inner ducts. 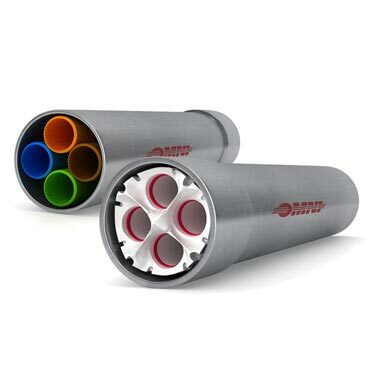 All Opti-Com® PVC coated steel fittings are supplied with threaded and coupled ends. Each fitting is provided with a gasketed Opti-Com® coupling used to join inner ducts. Fittings are available for OC43 three-way or OC44 four-way inner duct configuration. PVC-Coated Steel Opti-Com® is manufactured in 10-foot layable lengths with threaded and coupled ends. Each 10-foot length is provided with a locking external coupling and a gasketed Opti-Com® internal coupling for inner ducts.